Andrea Torres is currently Manager, Marketing & Partnerships at Endeavor Miami. Prior to her joining the team at Endeavor, Andrea worked at Univision Communications as Director of Strategic Planning. There, she helped drive strategic and operational initiatives spanning different departments and platforms, focusing on content strategy. Before Univision, she managed the strategy team at FUSION, a multi-platform media company that champions a more diverse and inclusive America and part of the Univision Communications family. She also served as Segment Producer for one of the flagship shows on the network and was part of the team that helped launch and develop it. 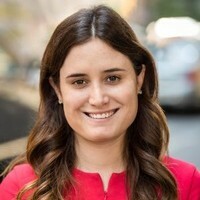 Andrea graduated with honors from Middlebury College in 2013 and completed an Advanced Management Program in Media and Entertainment from IESE Business School in Barcelona.